UNCASVILLE, CONN. – June 12, 2018 – Some of the world’s most collectible trucks and SUVs are set to haul in some heavy bidding action during Barrett-Jackson’s 3rd Annual Northeast Auction, June 20-23, 2018, at Mohegan Sun in Connecticut. Various models of the iconic British-built Land Rover Defender are already consigned, including a ’87 right-hand-drive Defender 90 (Lot #746) that features custom orange with black accents, roll bar, 20-inch wheels and leather diamond-stitched seats. American-built trucks will be well represented during the auction, including “McHenry’s Golden Nugget,” a ’55 Chevrolet 3100 (Lot #415). A prime feature in “Truckin’ Magazine” this custom Chevy truck is powered by a 5.7-liter Vortec V8 and is wrapped in Gold Nugget Kandy custom paint with clear coat. With a little over 3,000 miles since its frame-off restoration in 2014, Lot #353, a ’53 Chevrolet 3100, is powered by a 383ci stroker engine. Inside, this truck features custom door panels, leather seats, full carpeting, Dolphin gauges, Bluetooth stereo and a customer fiberglass mold for the speakers. Barrett-Jackson will also auction several examples of the “Best of the British” with custom and restored Land Rover Defender models, including Lot #737, an ’87 Defender 110. 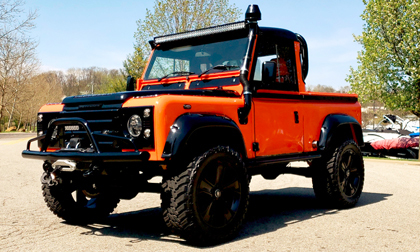 Completely restored over a year, this custom Defender is powered by a 2.5-liter diesel engine and features a new air-conditioning system, Puma suspension with 2-inch lift kit, Kahn wheels and side step. A right-hand-drive ’91 Defender 110 truck (Lot #391) has a high-capacity bed with diamond-plate lining, Terra Firma tubular winch bumper and a snorkel for enhanced engine breathability. One of 500 built, a ’93 Defender 110 (Lot #661) has 17,724 actual miles and comes with air conditioning, front brush guard, rear step bumper and ride-leveling suspension. Barrett-Jackson’s 2018 Northeast Auction is June 20-23, 2018, and will be the first event inside Mohegan Sun’s new 125,000-square-foot Expo Center. Preview Day/Family Value Day is Wednesday, June 20, with the collector car and automobilia auctions beginning Thursday, June 21. A full schedule of events, including TV times, is available at Barrett-Jackson.com. The docket is now live; for information on becoming a bidder, go to www.Barrett-Jackson.com/bid. To submit an application to consign at the 2018 Northeast Auction, click here. Also, follow Barrett-Jackson on Facebook, Instagram, LinkedIn and Twitter for the latest news and information heading into the 2018 Northeast Auction.